ruthdelacruz | Travel and Lifestyle Blog : Contest: Coca Cola Any Concert Anywhere in the World: 30 Winners to Rock, Dance and Roll! Contest: Coca Cola Any Concert Anywhere in the World: 30 Winners to Rock, Dance and Roll! 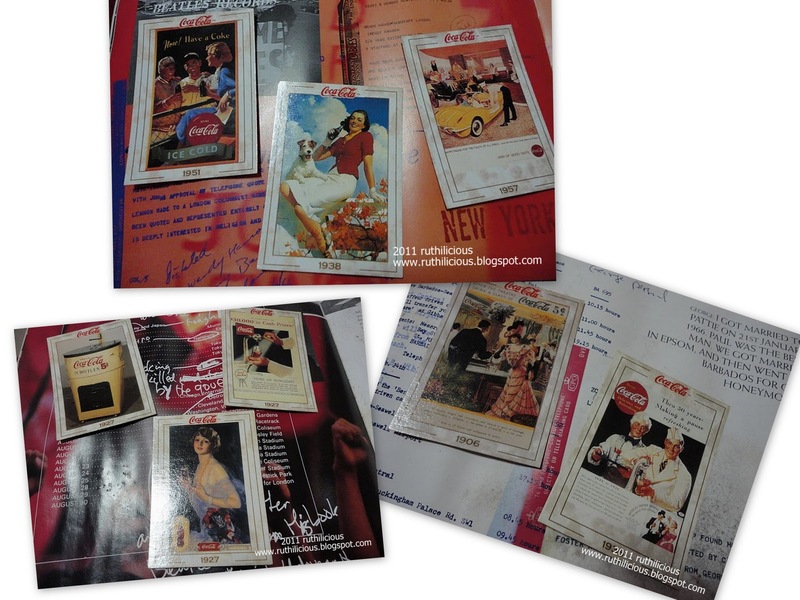 I have bought these nice Coca Cola cards from Ebay out of boredom. I saw that they were selling at Php10 starting bid, so I placed a bid on each card just because I am bored and I want to have that shopping hype again, and luckily I won! I was planning to have them framed, but I am already drowning with too much tasks, errands and commitments, I have totally forgotten that I have these precious cards until I stepped foot in The Real Thing Diner. The Real Thing Diner is a Coca Cola inspired diner which looks like a Coca Cola Museum. It is just a perfect place to hold the Blogger Event/Launching of the Coke Anywhere Concert Promo. So the event started with the host asking bloggers, what excites us? If only I would given the chance to hold the mic, I would tell the audience that booking a fligh excites me the mostt! It means, packing my stuff, meeting new people, going to places, exploring culture, eating new dishes, shopping and cam-whoring! So our favorite Coco Cola has cooked (or should I say, has mixed?) a new contest that would literally excite all contestants! The prize is not just cash, not just a ticket to the concert, and not just a trip but a 3d/2n vacation to anywhere in the world where you want to watch the concert of your favorite artist! The most exciting thing is that there would be one winner everyday from March 1 to March 31! You can choose to wiggle your waist with Shakira in Buenos Aires, raise your hands for Usher in Germany, feel the noise and not just hear the music of Deftones in Canada, fall inlove all over again for Westlife in Liverpool, or dance with the Glee Cast in London! So before you prepare your luggage and pack your stuff, first things first hoard Coca Cola products crowns! (you wouldn't want the nearest Sari-Sari Store to beat you on the number of entries!). So gulp down and save the crown. See below for the complete mechanics. Thirty (30) lucky individuals will win a trip with accommodations for himself/herself and one (1) companion to watch a concert of their choice anywhere in the world. Choices of concerts will be found on www.coca-cola.com.ph. There will be one (1) winner everyday for thirty (30) days representing each day from Mar. 1 to Mar. 30, 2011. To send a valid entry, consumers must place five crowns of the same brand and/or flavor in an envelope with their name, complete birth date, complete address, contact number, signature and the concert of their choice in a piece of paper. Drop in designated drop boxes found in Coca-Cola sales offices and Ace Promo offices nationwide OR mail their entries to Ace Promotion Offices. Mailing addresses can be found on www.coca-cola.com.ph. Consumers can send as many valid entries as they want to increase their chances of winning provided that these entries fall within the duration of the promo period. All non-winning entries for each week are still qualified for the succeeding weekly raffles. Each week, weekly winners will be announced in MYX. Weekly Raffle draws will be held every Friday of that week. Winners will be notified via official telegram and verified through a phone call by The Coca-Cola Export Corporation’s (TCCEC) Third Party Supplier. Winners should present the official notification telegram sent and at least 2 valid IDs to claim their prize. Details of how to claim the prize will be indicated in the official telegram sent. Winners must nominate only one (1) companion to be included in the trip to the concert. Any other companion aside from the one officially nominated by the winner will not be the responsibility of TCCEC. If the winner is 18 years old and below, a legal guardian must be the official companion. This promotion is open only to consumers 13 years old and above. The consumer must be 13 years old at the start of the promotion on Feb. 14, 2011. Accommodations at a hotel for 3 days, 2 nights. Concert tickets – category or seat type of the concert ticket to be determined by TCCEC and subject to availability. TCCEC will not be responsible for processing any travel document/visa needed by the winner and his/her companion to travel to the concert in the country of his or her choice. However, TCCEC may give the winner a Certification of Prize Entitlement. The winner must be physically fit and capable of travelling, this must be supported by a medical certificate. The winner will be solely responsible for his actions during the trip and TCCEC will not be responsible for any untoward incidents that may occur during the trip. A waiver document from TCCEC must be signed by the winner before the actual travel. Winners will be accompanied by TCCEC Representatives or agency representatives. If for any reason the winner cannot travel to the country or concert chosen, TCCEC has the option of allowing the winner to choose another concert in the website in coordination with TCCEC’s Third Party Agency or convert the prize to cash in the amount stated below. Prizes are non-transferable but are convertible to cash in the amount of Php 25,000 per winner. No other amount shall be payable by TCCEC to a winner who has opted to convert his prize to cash. Only the Transfers / Transportation to Metro Manila NAIA for winners coming from Visayas and Mindanao will be shouldered by TCCEC. 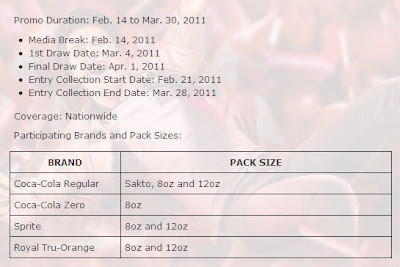 This promo is valid until March 30, 2011 only. Last day of collection of entries is March 28, 2011. Entries and Purchases after this date will no longer be included in the promotion. A verification process will be conducted upon redemption to determine authenticity of the entries and identity and qualification of the winners. All decisions made by TCCEC on all matters related to this promotion are final. In case of disqualification, an additional five (5) back-up names/entries will be drawn per prize. Employees of TCCEC, CCBPI, MEPs, McCann Worldgroup Philippines, Ace Promo and Marketing Corporation, ABS-CBN, including those of their parent companies, affiliates, their third party suppliers, FDA and their relatives up to the second degree of consanguinity and affinity are disqualified from joining this promotion. If you want to check the validity of the mechanics, visit the official Coca Cola site here to view. Dunno where to send your entries? Click here for the Drop Centers. So start saving your crowns and prepare your rock and roll outfit! But wait, there is more, Coca Cola has another contest for you! It's a dream come true! Mechanics would be posted in a bit! The Coca Cola Any Concert Anywhere in the World is in partnership with Warner Music and Sony Music. © ruthdelacruz | Travel and Lifestyle Blog : Contest: Coca Cola Any Concert Anywhere in the World: 30 Winners to Rock, Dance and Roll!